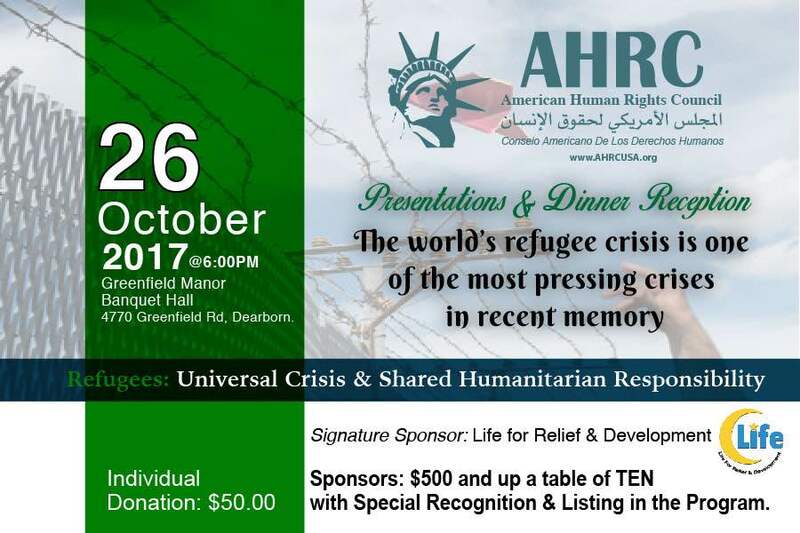 On Thursday, October 26, 2017 at 6 p.m., the American Human Rights Council (AHRC-USA) will be hosting a special dinner reception regarding the world’s refugee crisis. The reception will be held at the Greenfield Manor Banquet Hall located in Dearborn, Michigan and will feature an international speakers, one a Syrian from Jordan, Dr. Nahed Ghazzoul. The reception’s keynote speaker and special guest, Dr. Nahed Ghazzoul, is an internationally-recognized authority on the Syrian refugees. Dr. Nahed Ghazzoul will deliver remarks addressing this pressing global challenge. Dr. Nahed Ghazzoul, an assistant professor at Al- Zaytoonah University in Amman, Jordan is an internationally recognized authority on the subject of refugees, especially the Syrian refugees. She has participated in numerous forums and international conferences related to this most pressing challenge facing the modern world. Dr Ghazzoul is a Syrian activist who is in direct contact with the Syrian refugees in Jordan, working in person, and with two volunteer teams. She tirelessly helps refugees in the educational, medical and relief issues. Dr. Ghazzoul has traveled around the world speaking as an authority on the Syrian refugee issue. Dr. Sbeiti is a Professor of Neurosurgery at the Lebanese University Health Department with over 14 years of postgraduate experience and a record of 42 scientific publications and works. Dr. Sbeiti has been a member of the Lebanese Neurology and Neurosurgery Association since 1997. He has experience working with the Syrian and Palestinian refugees. In addition, there will be special presentations and a documentary highlighting the refugee crisis and its impact on America and the rest of the world. This is an important opportunity to take a deep look and develop a solid grasp of one of the most important issues facing the world today. The Reception is expected to host over 500 honored guests, dignitaries, officials and community members. AHRC and its staff and volunteers are working diligently to organize and facilitate a great evening and facilitate a remarkable program for the occasion. We kindly ask our guests to arrive at the Greenfield Manor Banquet Hall located on 4770 Greenfield Road in Dearborn no later than 6:00 p.m. This allows us to seat everyone in time to begin our program as scheduled. There is no need for paper tickets. AHRC “Meet & Greet” Host Committee members will direct you to your designated table upon arrival.